Pair this with a flowy pant or pencil skirt, this blouse is your go-to piece for everyday femininity. A fitted silhouette with a round neck and V back, comes with a concealed side zip. 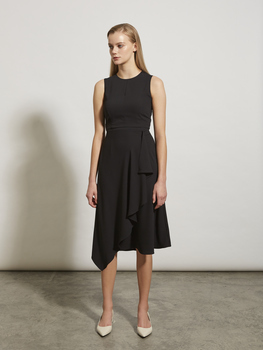 Fabric has a light stretch and curve sleeves feature a low armhole. Unlined. Fits snugly. Size up if you prefer. Please note the measurements for underbust is measured under the bustline. Model is 176cm and wears Size S.Measured in inches, side to side, laid flat. All measurements are subject to 0.5” difference.